, a very celebrated French Protestant, was son to John D‘Aubigne, lord of Brie, in Saintonge, and born in 1550 at St. Maury. He made such proficiency under his preceptors, that at eight years old he was able to translate the Crito of Plato. Having lost his father, who left him only his name and his debts, at the age of thirteen, he betook himself to the profession of arms, for which a spirit and zeal particularly ardent and persevering seemed to have qualified him. He accordingly attached himself to Henry then king of Navarre, who made him successively gentleman of his bed-­chamber, marshal of the camp, governor of the island and castle of Maillezais, vice-admiral of Guienne and Bretagne, and what D’Aubigne valued most, his favourite. But he lost this last honour by a want of subserviency to his pleasure, and a stern and uncourtly inflexibility. It is well known that ingratitude was not the failing of Henry IV. 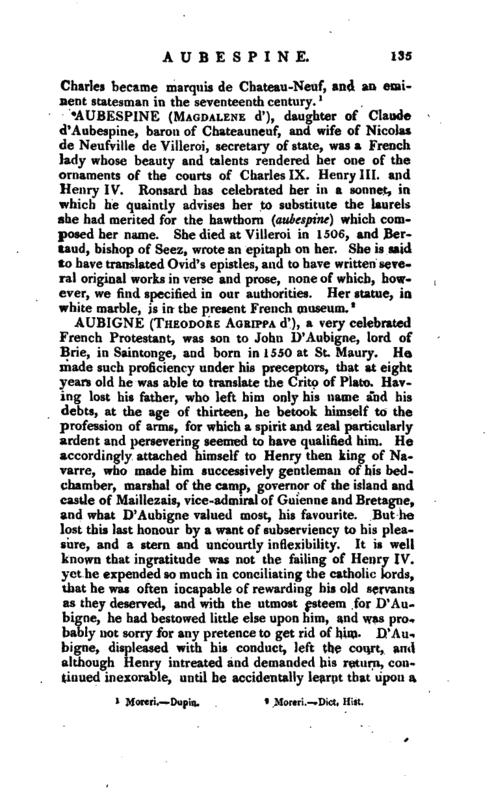 yet he expended so much in conciliating the catholic lords, that he was often incapable of rewarding his old servants as they deserved, and with the utmost esteem for D‘Aubigne, he had bestowed little else upon him, and was probably not sorry for any pretence to get rid of him. D’Aubigne, displeased with his conduct, left the court, and although Henry intreated and demanded his return, continued inexorable, until he accidentally learnt that upon a | false report of his being made a prisoner at the siege of Limoges, the king had ordered him to be ransomed at a great expence. 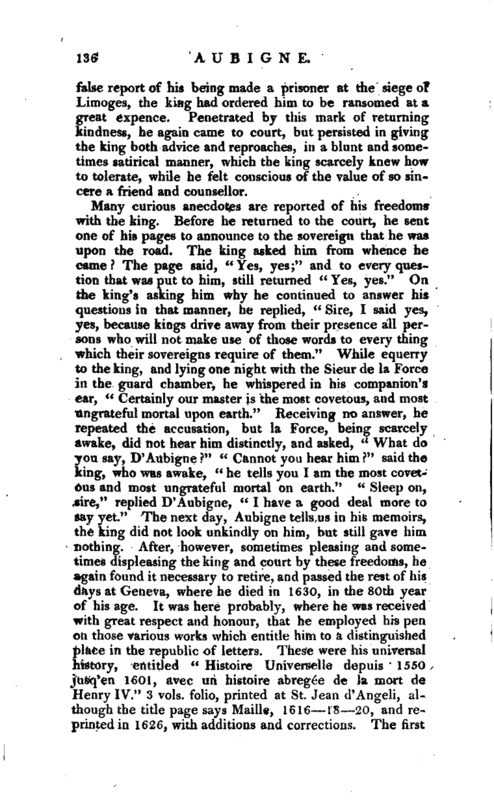 Penetrated by this mark of returning kindness, he again came to court, but persisted in giving the king both advice and reproaches, in a blunt and sometimes satirical manner, which the king scarcely knew how to tolerate, while he felt conscious of the value of so sincere a friend and counsellor. Dict. Hist.—Moreri.—Marchand—Dict. Hist. 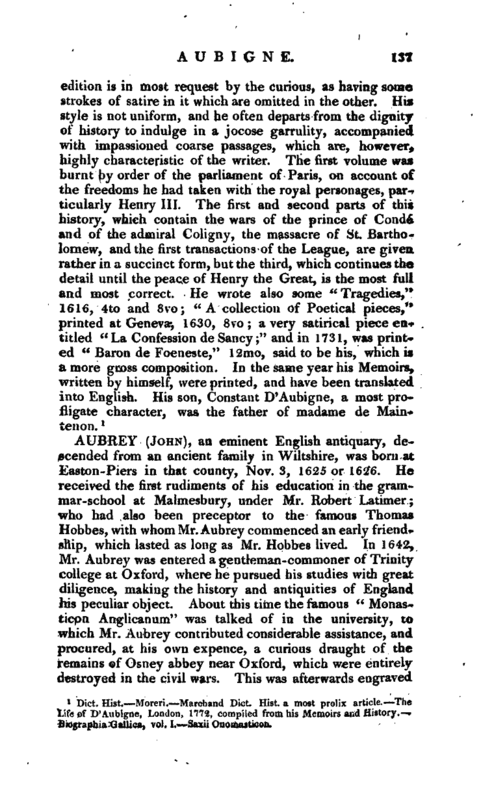 a most prolix article.—The Life of D’Aubigne, London, 1772, compiled from his Memoirs and History.— Biographia Gallica, vol. I.—Saxii Onomasticon.